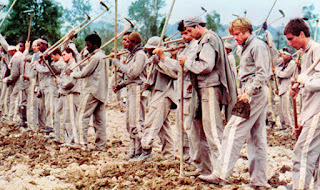 In the excellent 1980 Robert Redford prison movie Brubaker, the chief warden discovers multiple unmarked graves in the prison grounds and his attempts to unravel the mystery lead to political scandal. In the mid-2000s big questions were being asked about the possibility of bodies having been secretly buried in the grounds of Boggo Road. Was there a Brubaker-style mystery to be unearthed there? All the rumours suggested that indeed there was. The mystery took shape back in the 1970s, when excavation work for sewerage pipes was taking place in an exercise yard in the new No.1 Division and three officers noticed a line of circular patterns in the walls of the newly-dug trench. One of the officers recalled seeing twelve ‘dark patches’, all of them about 45cm below the surface, 30-40cm in diameter, and uniformly spaced about 60cm apart. Another recalled seeing only four patches, which were light grey in colour as opposed to the more naturally-coloured soil surrounding them. I have in my possession stat decs and hand-drawn maps from these men relating to this incident. 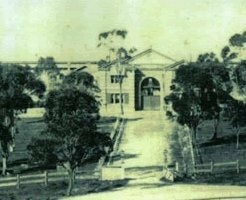 When they reported what they had seen, their bosses informed them that, ‘all bodies were reinterred to Dutton Park' (meaning South Brisbane Cemetery), indicating that on-site burials actually had taken place at some point. They were also ordered to keep quiet about the incident. One of the officers, however, took some samples from the patches, which he described as being ‘very gooey... like wet clay’. These samples were stored for thirty years before being handed over to the Boggo Road Gaol Historical Society and then forensically tested at the University of Queensland in 2003. The tests discovered microscopic bone fragments of Caucasian origin, and degraded DNA sequences. The report concluded that the DNA was either from the remains of at least two individuals buried at the site, or from more recent contamination of the samples, or from a combination of these two sources. It called for further testing and an excavation of the site. An archaeological survey of the No.1 Division in 2005 (at which I was present) failed to locate any graves, although it is very possible that the test trenches were dug in the wrong place. It has also been suggested that most of the soil in the area was removed during the 1990s demolition of the No.1 Division, which would have also removed any trace of the graves. So were there bodies at Boggo Road? The 1970s trench was dug in an area that, according to prison lore, was once a burial ground. This was, in previous years, just outside the north-eastern wall of the original No.1 Division, built in 1883, not far from the original Superintendent’s House. Older officers recalled seeing white crosses painted on the outside of the prison wall there in the 1930s, and when one superintendent’s wife maintained a garden near there, the officers would joke with her about not gardening too close to the graves in case she dug up a skull. 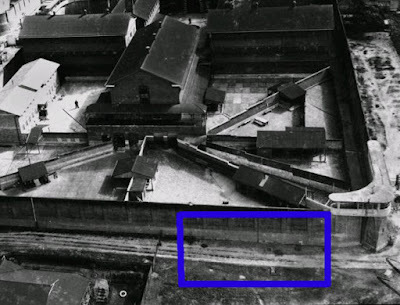 When the new No.1 Division was constructed this area was underneath an exercise yard. There is also hearsay evidence of graves at the front of the prison. A 19th-century photograph (below) shows some white fencing, similar to a grave border, under a tree to the front left of the driveway from Boggo Road. A retired officer who owned the image claimed to have seen several grave sites here in the 1930s, some being fenced and one bordered with stones. In the photograph, however, this area is partially obscured by trees, making it difficult to observe the alleged graves. The front of the prison in the late 19th century. The alleged graves referred to above were said to be to the left of the driveway under the trees (BRGHS). So we know that early officers have a memory of a couple of burial sites, and that in the 1970s grave-like markings in the ground were seen during excavation work. It seems very likely that there were graves in the north-eastern area at some point, but these graves would have been destroyed in subsequent construction and demolition work. Which leads to a bigger mystery...who were they? The graves could not pre-date the prison, as they would have been exposed during the original construction works. It has been suggested they were the remains of executed prisoners, but Brisbane City Council records clearly indicate that all the prisoners hanged at Boggo Road were buried in lot 6B at South Brisbane Cemetery so I would think that explanation is unlikely. They could have been the graves were those of other prisoners who died at the gaol from causes such as suicide, disease or murder. I have heard it said that they could be bubonic plague victims, but plague victims were quarantined in a building at Colmslie and there is no way the authorities would have held such a person inside a tightly-packed prison. Over a hundred inmates died at the site in the 117 years that prisons operated there, some from highly infectious diseases, but the records regarding these burials are incomplete. As far as we know, records regarding deaths may also be incomplete. The truth is that, if there were graves behind Boggo Road, nobody knows who the people were. Different people may have different theories, but no solid evidence has been provided to back them up. The bodies have long gone, but the mystery remains for now. For more on this subject, see my article ‘The Dead Outside the Fence: Burying executed prisoners in Brisbane, 1830-1913’, in the Queensland History Journal vol. 20, no.8, November 2008 (Royal Historical Society of Queensland).